LIKES: CHASE FERAL CATS OUTSITE, BARK AT THE BATS IN THE TREE, EAT FLIES AND LOVES ATTENTION. DISLIKES: ANYONE COMING NEAR THE HOUSE, OTHER ANIMALS. MOST MEMORABLE MOMENT: WHEN YOU ORDER FOOD OR SOMEONE KNOCKS AT THE DOOR AND SHE CHARGES AT THEM. Honey is an old dog (10+). 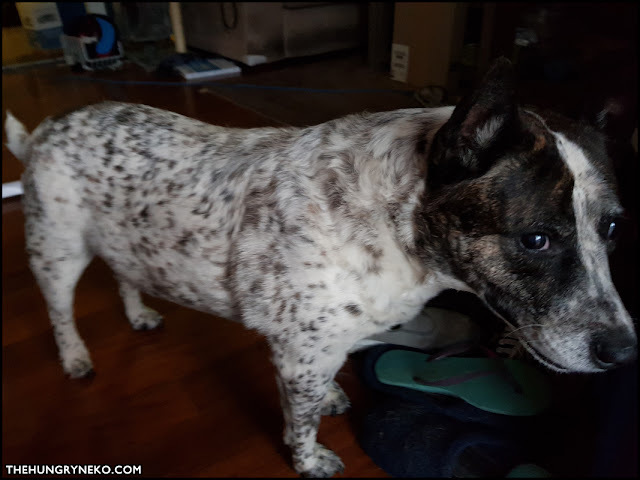 She is Staffy cross Cattle dog. She is full of energy and loves love. When she was a young pup, her body was mainly a brown honey colour. Now as a bigger dog, she has grown out of the colour and has a more dominant black and white fur. A few years ago Honey had a lump on her stomach. It was cancer and the vet removed it all. We were told she only had one more year to live. Since then we have allowed her to sleep in side and live a luxury lifestyle. Three years later she still here and now hates being outside.. I like to call Her a glutton, as everything you put in front of her, she eats or catches mid air. I even fed her pancakes once and she had to go to the vet. Pancakes can make a dog constipated. $500 x-ray later, expensive lesson learnt. Honey likes to run around and play fetch, but never brings the ball or rope back. Her favourite toy might actually be plastic bottles. She sheds so much hair in my house, we vacuum regularly and brush her regularly. She is a very happy dog and snores as loud as a tiger.